A man has been found guilty of murdering a mother-of-five at the home they shared in Middlesbrough. Natalie Saunders, 33, died in October following a violent attack by her partner Stephen Charlton. Teesside Crown Court was told he had subjected her to physical and emotional violence during the course of their relationship. 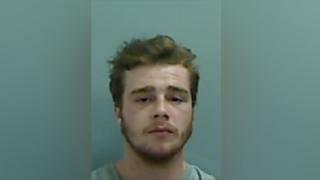 Charlton, 24, of Tomlinson Way, had denied murder but was found guilty. He will be sentenced on Thursday. Following his conviction, Lorraine Cooper from the Crown Prosecution Service, said: "This case highlights the very real dangers faced by those in abusive domestic relationships. "The significant catalogue of injuries he delivered clearly demonstrated his propensity for physical violence and his lack of control over his own rage." Image caption Natalie Saunders' family described her as a "beautiful lady"
Ms Saunders' family said in a statement: "Domestic violence has taken a precious life from us and left our family serving its own life sentence. "No other family should have to experience what we have and more importantly, no other person should have to suffer, especially in silence. "Please anyone who is being subject to domestic violence whether physical or mental, big or small, please speak up. "Speak up if it's a neighbour, friend or maybe someone you don't know, because that call might just save someone's life."